Although it's very cold and snowing too, the days are getting longer and brighter now and there's much more light. During the darkness of winter, I didn't seem to notice defects so much, but somehow now those dark circles under my eyes and the little red blemish on my cheek have become more apparent. The wintry weather has taken it's toll on my skin too! I am using my under eye cream and soothing cleanser designed for redness etc and these products certainly do help, but in the end there is still a definite need for a good concealer. I find that the trouble with many concealers is that they look okay when applied but seem to melt away once I go out and about. I wanted a concealer that would look good and last. 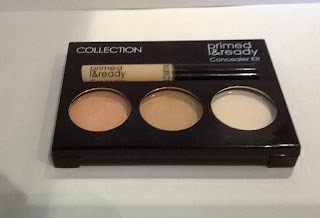 Having heard some good reports about COLLECTION concealers, I decided to buy one of their products, COLLECTION primed & ready Concealer Kit and give it a try. The concealer kit is attractively presented in a very professional looking, neat black compact. 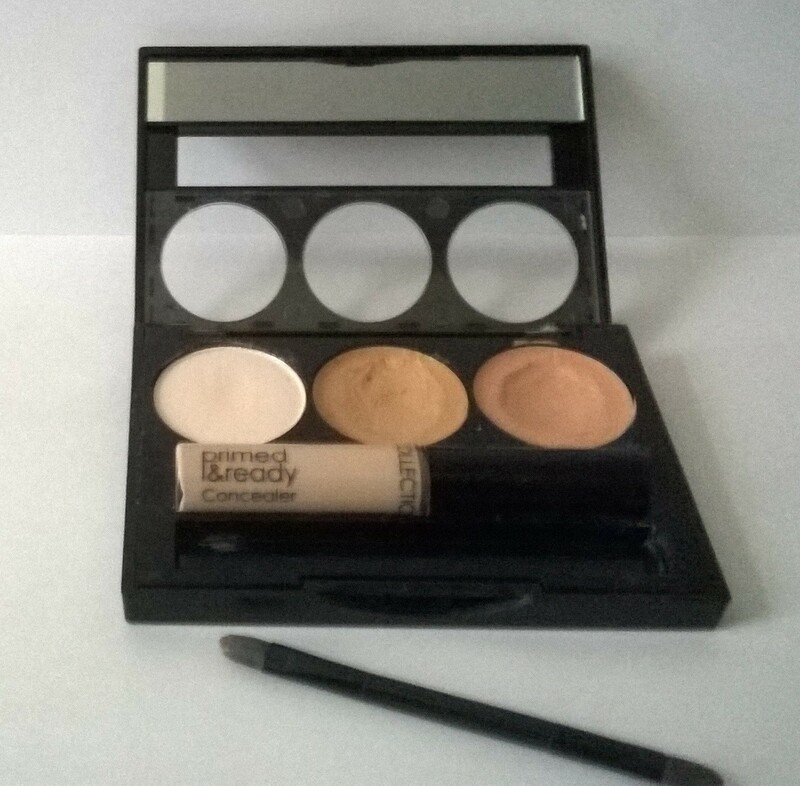 The compact contains two cream to powder concealers in different shades, a liquid concealer, a translucent setting powder and a double-ended brush. There is even a little strip of mirror at the top of the lid inside, so it's ideal if quick touch-ups are needed when out. The kit is intended for use after applying foundation, to conceal dark under eye circles and shadows and any other flaws. The idea is to mix the cream and liquid concealers to produce the ideal shade for the skin tone, then blend using the brush and finish off with a dusting of the invisible setting powder. I applied the concealers as above and I was very pleased with the results. The coverage was good and I liked the soft, creamy texture of the concealers. The effect was natural, without that chalky, grainy look that some concealers make, especially on the under eye area where the skin can be dry or lined. While I was out, the concealers stayed on perfectly and really did prove to be long lasting. 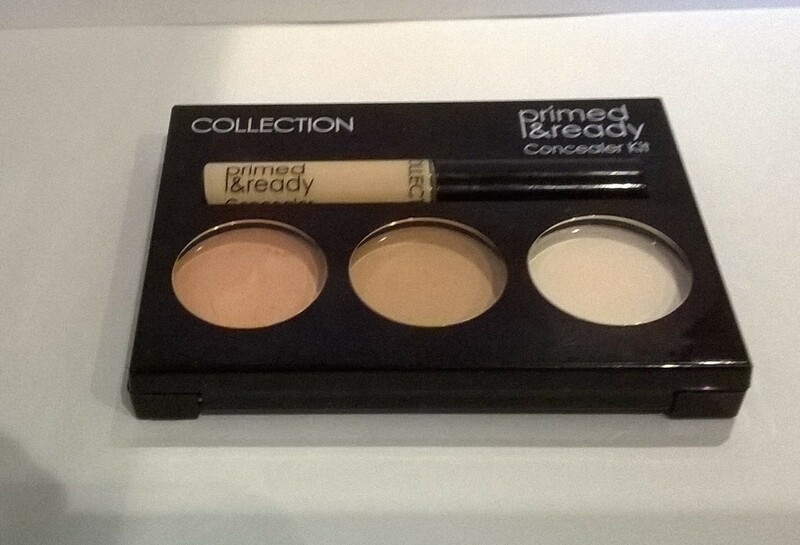 I am delighted with my COLLECTION primed & ready Concealer Kit and I must add that it was at a reasonable price that didn't break the bank! COLLECTION offer a wide range of cosmetics at affordable prices and I definitely intend to try some more now.